We have all been there. You turn on the television to see how the weather is going to be that day. The weatherman confidently tells you that it will be bright and sunny. Then, not more than after the report, clouds quickly begin to form and before you know it, sunshine has turned to rain. Ambient Weather makes a couple appearances on our list of home weather stations, but they often come with issues. Depending on the extent of your need, this brand may serve you well. However, do not expect the precision available with AcuRite of La Crosse. That being said, there are some advantages to the Ambient Weather. First, in terms of value, you will be hard pressed to find a better one for a weather station with indoor and outdoor units. Be forewarned, the outdoor unit is not made from durable materials. As such, it may not last long before failing or needing repairs.Still, the outdoor unit is at least easy to install. The indoor unit is solid, but unspectacular. Its readings are accurate and reliable over time. Unfortunately, the console is a bit cluttered and can be difficult to read for some consumers. Get ready, because AcuRite produces a number of wireless weather stations and many of their products have made it onto our list. The first is the 01015, but do not let its position fool you. This is a solid weather station. It provides a number of different atmospheric variables like rain, rainfall history, wind speed, wind direction, temperature, humidity, weather forecast, barometric pressure, and high and low records. Moreover, it will display these conditions on a convenient weather ticker at the bottom of the display. Beware though, the outdoor unit has a few issues with durability. The sensor chip has been known to corrode and various catches must be removed first in order for it to properly function. However, the company’s customer service will provide quick assistance should you need it. La Crosse is the other big winner on our list and even holds the number one spot as the best wireless weather station of 2017. Unfortunately, La Crosse does not offer a product with an outdoor sensor that can cover the range of variables that AcuRite does. In this regard, you will have to determine whether quantity or quality is more important. However, the first La Crosse, the 308-1412S, definitely provides the former, albeit in a bit of a stripped down offering. The number of variables the 308-1412S provides are a bit limited and relate more to current conditions only. One nice addition is the display. First, it is fully colored which makes identifying the different weather variables much quicker and easier. Second, it provides a nifty sample scene to give a visual impression of the weather in real time. This AcuRite seems almost like a combination of the previous two products, taking the best of both. However, the outdoor sensor will still present issues. Thankfully, AcuRite’s customer service is helpful and will ensure any problems are addressed. Aside from having a fully color display, one of the main advantages of the 01057RM is interactivity. The 01057RM will sync with your smart device and relay the information or even send you notifications. Moreover, you can also connect your 01057RM with larger social weather tracking communities. Of course, all of these benefits do come at a premium. As one of the most expensive products on the list, price may become more of a factor when differentiating between what you want and what you need. If you think you are having deja vu, do not second guess yourself. 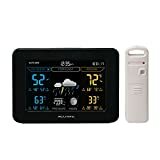 This AcuRite weather station is nearly identical to the previous entry on our list with two major differences: price and connectivity. The cost of this model is about 20 percent cheaper than the previous one. However, you are also giving up the ability to connect with your smart device and larger online communities. Still, this model provides all the local features that the previous one does–including the fully colored display. And again, their customer service is excellent ensuring and issues get resolved. The second La Crosse to grace our list is here for one reason and one reason alone: value. It may not do as much as the other options so far, but what it does, it does exceptionally well at a great price. Keep in mind, this model requires a bit more preparation than the others, not with installation though. Instead, the outdoor sensor will need some protection or it may not last long. Still, this weather station provides the expected atmospheric variables and then some. With an atomic clock, it tracks various astrological changes like the phases of the moon. While the display is not colored, it is easy to read the data. Also, a cute animated person shows you what type of clothing is needed. This AcuRite is a bit of a mixed bag, though ultimately a good deal. However, it is a bit more limited than the other models on this list. For instance, the display comes in a bright, fully colored readout. Unfortunately, it must also be placed below eye level or you will not be able to see the illuminated projection on the screen. The outdoor sensor is also a bit of a wash. While the signal is strong, it does not have the ability to read as many variables as other AcuRite weather stations. Moreover, it does not come with a specific housing unit which can make placement a bit tricky. However, the sensor itself is a bit more durable. This AcuRite very much has a Goldilocks appeal. It provides a number of the best features you do not often find while still managing to remain at a relatively decent value. Still, it is one of the pricier options on the list. Much like the 01057RM, this model also offers the ability to sync your smart device to the weather station and keep tabs on the conditions or receive notifications when extreme weather occurs. It also allows you to upload your station’s data to different online weather tracking communities. It features a fully colored display that is not difficult to read. Unfortunately, the cut in cost comes from a reduction of tracked weather variables. This La Crosse appears on the list for the same reason as the previous model except more so: value. Much like the earlier entry, the price is exceptionally low; however, you are also sacrificing even more information. If the previous La Crosse was bare bones, then this one weans it down to the marrow. Gone are the astrological trackers or the animated character providing dress suggestions. This is simply a no-nonsense weather station. You are given the temperature and the humidity as well as their ranges for that day. However, it does feature a perfectly accurate atomic clock and is noted for fewer durability issues. If the previous entry was based on value, this is the floor in that respect. There simply is not a cheaper option on this list. Of course, there is not a simpler option either. This Ambient Weather station provides only two different variables: the temperature inside and the temperature outside. However, so long as you do not need anymore information than that, this is an excellent weather station. Where some of the more advanced weather stations have issues with their outdoor sensor, this Ambient Weather model is accurate to within +/-2.0°F. Moreover, the absence of other variables allows this model to present a clean and clear display. As an added bonus, there is no programming required, and setting up the outdoor sensor is a breeze. While not nearly as extreme as the previous entry, from this point on, the list is about simplicity, because most of us are either not interested in tracking weather or simply do not need to. That being said, there are still numerous features that can distinguish even the simple, value options in home weather systems. This AcuRite is similar to the previous model in many ways. It features the same outdoor sensor which has a bit of a rocky reputation. However, the entire unit is still easy to install. One improvement over the previous AcuRite is the display. While both are fully colored, this one features a better illumination projection system. You will still need to be careful as detail can be lost from positioning, but the range is much broader. The AcuRite 75077 is not for everyone, but has a solid advantage with its display. The most pertinent information is presented largest. Designed for people with poor eyesight, this is a give and take product. This focus prevents other variables from cluttering up the weather conditions you are most interested in knowing. Unfortunately, this also means that the other atmospheric variables can be a bit difficult to read. However, the display will also present a pictorial display, so you do not necessarily have to strain to read some of the other variables. Moreover, it comes with an atomic clock to ensure perfectly accurate time. The top three spots all go to La Crosse, though each offers you something a little bit different. This model offers you the most information at a great value. However, all that information comes at a cost: readability. This La Crosse at least features a fully colored and made sure that the most relevant information is also the largest. However, the other atmospheric variables can be a bit small for some people to see easily. 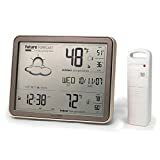 Still, with an atomic clock for incredibly accurate time keeping and an animated forecast, this weather station has everything you need. The alert features are just icing on the cake. If you think you are having a second bout of deja vu–this time with the La Cross instead of the AcuRite–do not worry. This product is incredibly similar to the previous La Crosse with one obvious difference: the display is arranged vertically. Considering they support many of the same functions and features, you may wonder why the display’s orientation would be such a big deal. The answer is that it makes the display easier to read. Whereas as the 308-1414B felt a bit cluttered and some of the print ended up being smaller than one would like, this model’s vertical alignment allows the information to be displayed in the same full color but without as much clutter. The final and top entry in our list of the best weather stations of 2017 gets back to the basics. Keep in mind, if you want a wide range of atmospheric variables, the second and third place options are better fits. If you are a weather aficionado, you might want to look closer to the beginning of the list. However, if you just want the basic weather with an easy to read display, then this La Crosse weather station is just right for you. While the display may not be colored, the digits are all the same size and 1” in height. Moreover, this model allows you to connect up to 3 different sensors to provide the most accurate reading possible. 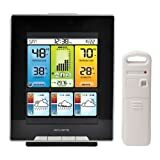 With a range of 330’, those 3 sensors can provide the most accurate readings of any home weather station on this list. Once you have decided to stop relying on the news or another source for your weather report, the next step is figuring out what you need in a wireless weather station. Unfortunately, the litany of features can leave even the most astute consumer’s head spinning. However, some features are more important than others. Easily the most important feature of any home weather station is accuracy. If the weather station is inaccurate, you may as well just stick with the news. After accuracy, connectivity and power are the most important. As we are reviewing wireless weather stations, connectivity refers more to the strength and consistency of the connection than the type. As for power, generally, there are plugins, battery powered, and solar. Solar is the most convenient but can be difficult to fix if something goes wrong. Plug-in is the most reliable but limits the weather station’s location possibilities. Battery powered is generally the more expensive in the long run but is reliable and can be placed anywhere. 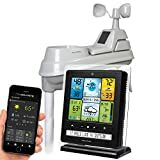 You can dump over $100 dollars into a weather station if you want, and if you are a weather tracking aficionado, that may well be the best approach for you. Unfortunately, you will generally pay a premium for outdoor sensors that often suffer from durability issues. However, most of us do not track the weather for a profession or as a hobby and, as such, have little need for the extra features or cost that comes with them. Instead, we generally require one thing above all others in a home wireless weather station: accuracy at a value. In that regard, the La Crosse Technology WS-9160U-IT shines the brightest, which is why it is our best wireless weather station of 2017.